Vacation Todd is very different than At Home Todd. Vacation Todd wakes up, grabs a beer, pours it over his “cereal flakes” and then heads out for a full day of drinking, socializing and just having a good time. Unfortunately for those who accompany me or happen to be around me, Evening Vacation Todd can be a little hard to bear. You can pretty much count on one of two outcomes: passing out before dinner or those around wishing I had passed out before dinner. After years of observations, Siete had decided enough was enough and implemented a new plan of action on our recent trip to Mexico. For the sake of the family and the sake of our marriage, Vacation Todd was only going to be allowed to stay for the first few days of our Forced Family Fun. Regardless of how things were going or how much longer the rest of the family might be staying, Vacation Todd would be leaving around day 4 or 5. In her mind, this was a well conceived plan. A plan that allowed me to have fun and enjoy vacationing with the family, but a length of time that wasn’t too long for me to piss everyone off……Riiiiiiiiight! Much to her displeasure, she under estimated my abilities. 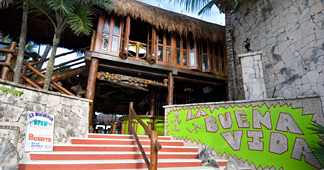 On day 3 of a 10 day trip, Vacation Todd was having a big time: deep-sea fishing in the morning, lunch by the ocean at noon and margaritas at La Buena Vida in the afternoon; doesn’t get much better than this. However, on this particular afternoon, Vacation Todd decides to crank it up a notch. Purchasing one margarita at a time is for normal folk and hell, we are in Mexico……“Jose, bring me a pitcher of margaritas”. As one might imagine, a successful outcome was not in the cards. As a matter of fact, I am researching this, but I may be the first paying customer to ever be cut off at a bar in Mexico. I guess launching kids across the pool (that’s right, this bar had a pool….how cool is that) while acting a fool is where Spaniards draw the line……do they not know I am a professional. Without getting into the details, the evening festivities continued to go south and Siete politely asked me to return home. But as luck would have it, flights in and out of Mexico are not as frequent as stateside, so Vacation Todd got to stay a little longer. And thankful I did. 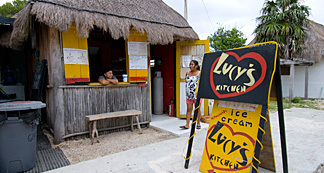 On the ensuing day, I was in need of a little food in my belly, so I wonder down to the plaza and saw a sign that said “Lucy’s Kitchen, Tacos and Homemade Ice Cream”…..hey, it’s Mexico. Things are a little different. Not wrong, just different. But despite the odd food combination and taking into account my lack of sobriety, I must say Lucy serves one mean taco. As a food blogger, often times I will try to coerce recipes out of establishments that I frequent and enjoy. But given my Spanish is limited to “Uno mas cerzeva, por favor”, getting the Lucy’s taco recipe was probably out of the question. Fortunately, I have a keen eye for flavors and although the tacos below will probably never quite taste as good as Lucy’s, they are pretty damn good. In a food processor, add pecans, sesame seeds, red pepper, sugar and salt and pulse until pecans are roughly chopped. Add corn flakes and continue pulsing until corn flakes and pecans are roughly equal size. Pour mixture into a large shallow bowl. In a second large shallow bowl, combine egg, mayonnaise and milk. Whisk until combined. In a third large shallow bowl, pour in flour. In a large cast iron skillet, heat approximately 2” of oil to 375°F. Next, dredge shrimp in flour and shaking off excess. Dip shrimp in wet mixture and then roll in corn flake mixture. Place in oil and fry until golden brown, approximately 2 to 3 minutes. In a large bowl, combine all ingredients. Cover with plastic wrap and refrigerate for at least one hour. In a small bowl, combine all ingredients. Cover with plastic wrap and refrigerate for at least one hour. Twisted Epilogue: At times, I am known to use my literary license and embellish a bit. But getting cut off at the bar is the truth and unheard of in Mexico. If you have ever been cut off in Mexico, please use my comment section to tell me your saga. 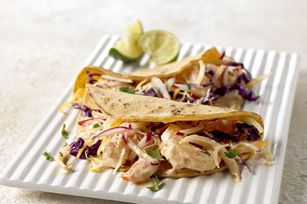 This entry was posted on Monday, October 31st, 2011 at 7:07 pm	and tagged with Akumal, Fried Shrimp, Lucy's Kitchen, Mexico, Seafood, Shrimp, Shrimp Tacos, Tacos and posted in Main Dishes, TexMex. You can follow any responses to this entry through the RSS 2.0 feed. since having known you all of your life I can only imagine seeing you lit! reading your blogs really make my day.Bud and they boys really did enjoy your seasonings. hoping to see you guys soon. It is probably best to take everything you read and divide by 5. I have been known to embellish a bit.